Welcome to the official web site of the Rocky Mountain Chapter of the Society of Fire Protection Engineers (SFPE). Fire Protection Engineering is a unique discipline which requires an understanding of fire and how it effects the built environment. Fire Protection Engineers use this understanding, coupled with the basics of engineering design, to help design safe buildings for people to work, reside, and perform recreational activities. More information about the profession of Fire Protection Engineering can be found HERE. 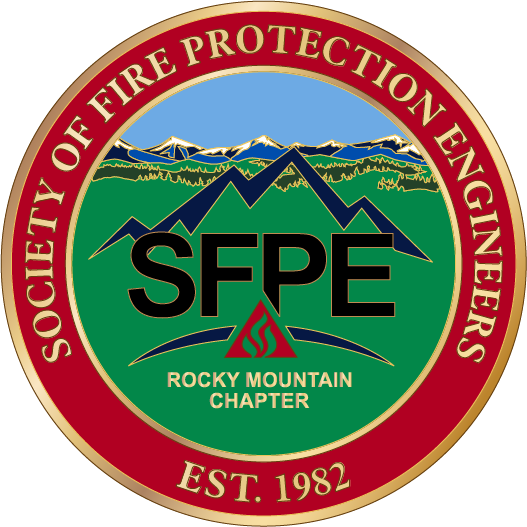 Since 1983, the Rocky Mountain Chapter of SFPE has provided a means of information exchange and a mechanism for education on various topics related to fire and life safety. Discussions relevant to modern fire safety design range from basic code requirements to the application of sophisticated computer models . The Chapter accomplishes its objectives by holding monthly lunch meetings and offering occasional seminars, as well as via members-only email information exchange. This website is intended to provide information about the Chapter’s activities including monthly meetings and outreach seminars, as well as information about our executive board, benefits of membership, how to become a member, and a list of Chapter members offering professional services. Have you seen our Challenge Coins? Get one today!